Combine in the order listed or per the directions for your breadmaker. Put salt and sugar in separate corners. Make a well in the center of the flour and place your yeast. Set to "Dough" cycle. My breadmaker's dough cycle takes just under 2 hours, including preheating time. After the dough was finished, I froze half and placed the other half in the fridge. 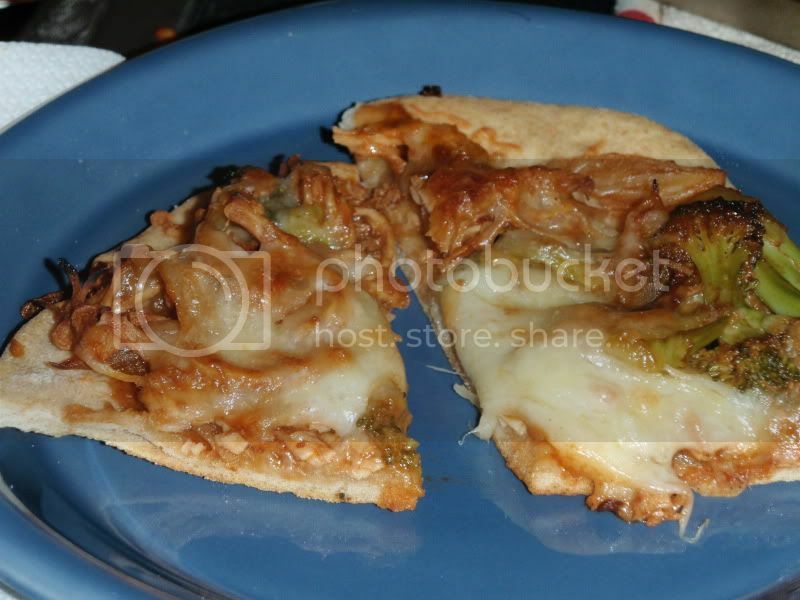 The next day, I made my favorite bbq chicken pizza using my new method of shredding chicken. Note: This is a pizza making method, rather than a recipe. I recently discovered steaming and shredding chicken and am thrilled with the result of soaking it in a sauce. Ingredients and the quantity thereof are completely up to you. Meanwhile, saute onion in olive oil until tender. Sprinkle with salt. Depending upon the sweetness of your bbq sauce, you could caramelize the onion which will take 10-15 minutes longer. Stir in shredded chicken and broccoli(I pre-steamed my broccoli). Top with sauce, rinsing out bottle with up to 1/4 c water. Cook for 5 minutes until everything in the pan has reached the same temperature or the until the broccoli is tender. Make sure to moderate your heat as not to cause too much of the sauce to evaporate. 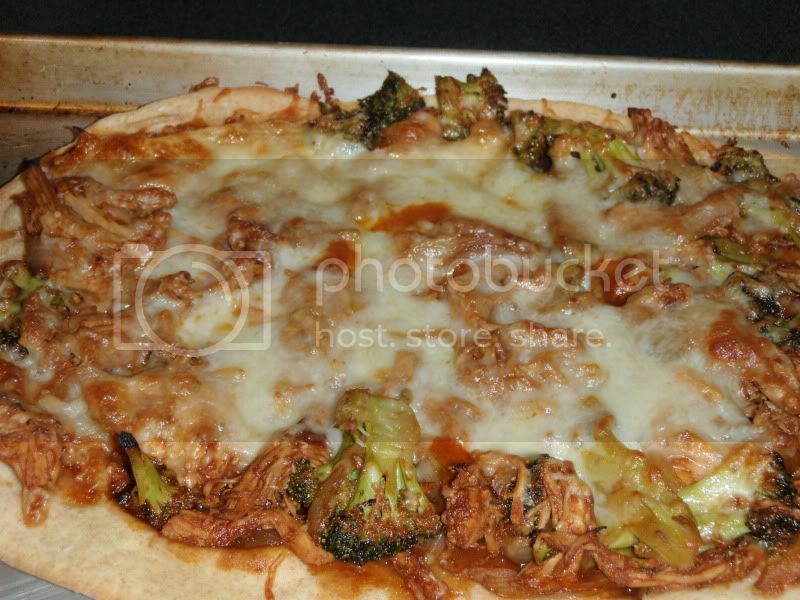 Spread meat/sauce/veggie mixture evenly over pizza dough. If you didn't prebake the dough, brush edges with olive oil for a nice browning. Bake for 10-12 minutes until cheese is golden brown. Makes 1 large pie or two smaller ones. Today I'm unpacking my scraproom!! !